Phoenix Rising, Part One: The Deuce | whitespace.
. Published on April 19, 2015 . In case you haven’t heard, there’s a shake up going on in Phoenix. Gould Evans and Canary have been cleaning up and packing our bags (and drawings, sketchbooks, and coffee cups) for a move to 521 South 3rd Street in downtown Phoenix. We’re excited to be active participants in the revitalization of downtown Phoenix and to embrace our regional shift away from auto-driven sprawl. My English grandfather liked to say to me, particularly while on the road to Flagstaff, “England is a land where a hundred miles is a very long way. America, by contrast, is a land where a hundred years is a very long time.” That statement rings particularly true in Arizona, a state that just recently celebrated its centennial, and where property can be deemed historic before hitting retirement age. Phoenix is also unique in that much its growth occurred within living memory. Or, it would be within living memory, if so many citizens weren’t transplants. We live in a place where 100 years is a really long time, and 30 years makes one a very settled native. In order to better understand our new home, I’ll be writing an ongoing series about the current happenings in downtown Phoenix and as well as about years past. Downtown Phoenix is exploding right now, but I think development could be made richer with an awareness of the history of the spaces evolving around us. First, let’s take a look at our neighborhood. The light green area highlights the first city blocks that comprised the official Town of Phoenix in the 1880s. 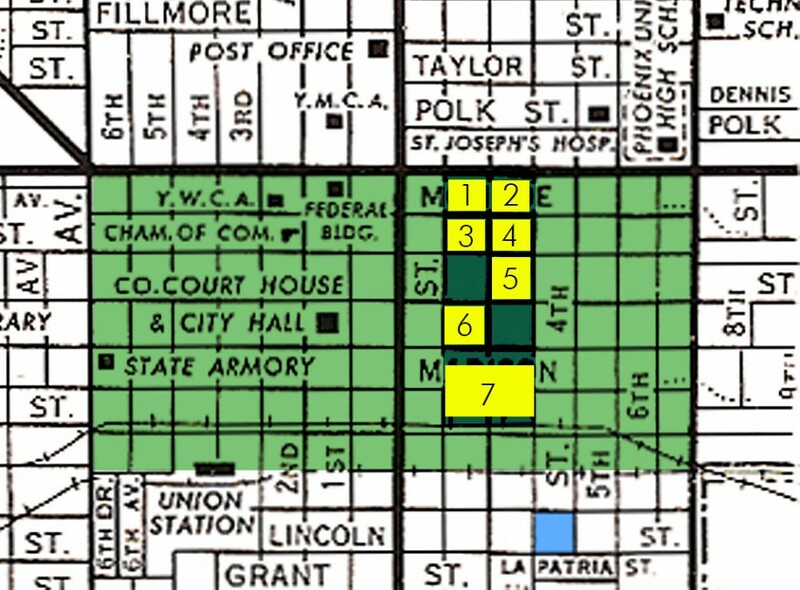 Bounded west to east by 7th Avenue and 7th Street, and Van Buren and Harrison streets from north to south, Phoenix didn’t expand beyond this zone until the early 1900s. The blue square marks the block of our new home on the Northeast corner of 3rd Street and Lincoln. Our building, a late 1940s-era brick warehouse, is located in the Warehouse District, also referred to by its older moniker, the Produce District. Almost completely faded from usage is a district nickname more commonly used for Phoenix’s old skid row north of the train tracks: the Deuce, marked on the map in dark green. 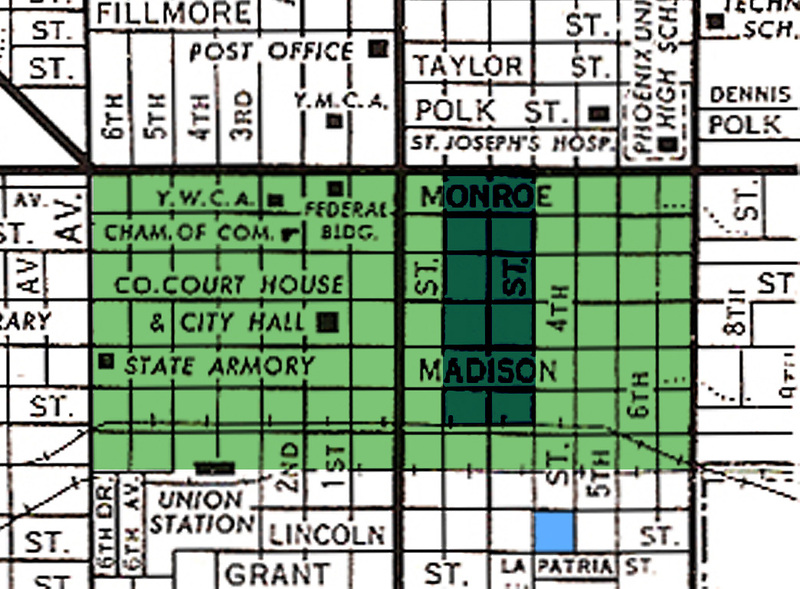 Second street served as the district’s spine running up through its midst. The origin of the name “Deuce” is hotly debated – some say it derived from ”Produce,” while others claim that Phoenix police popularized the nickname by saying they were going to “the Deuce” – i.e. skid row along 2nd Street. However its name came into use, the Deuce was undeniably colorful. Known for its Prohibition-era speakeasies, the Deuce remained a center for gambling dens and houses of ill repute long after the passage of the 18th Amendment. Less scandalous local businesses thrived here as well: side by side the liquor stores, cocktail lounges, and hourly hotels stood local grocers, delis, jewelers, and theatres. 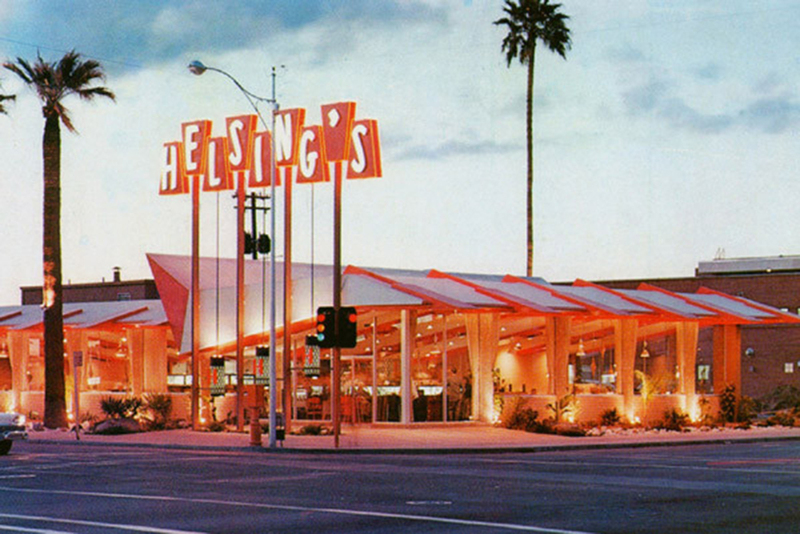 Shops and diners drew visitors from downtown. In addition to its businesses, the neighborhood also offered inexpensive housing for many of the city’s less affluent residents. 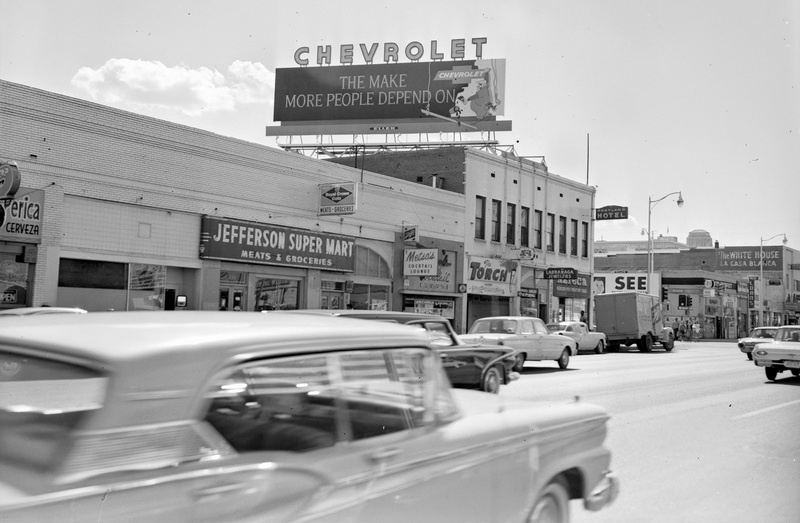 In the 1960s Phoenix caught “Urban Renewal” fever and began demolishing large chunks of its once-walkable downtown. The city tore down the groceries, motels, and all-night diners and replaced them with larger structures like Symphony Hall. This demolition strategy pushed poorer residents from surrounding areas into what remained of the Deuce. In the 1980s, the city razed the majority of the remaining buildings in the Deuce to make way for the sprawling Convention Center. The city needed space, it claimed, for projects that would beautify the city, communicate civic pride, and bring suburban dollars to downtown. Because the demolished buildings lacked the traditional historic beauty of, say, Pennsylvania Station in New York, no accompanying public outcry was ever raised, no historic preservation movement sparked. The structures being destroyed were also considered peripheral to, and implicitly of less value than, the downtown core. The demolishing continued, and by the late 1980s, 10 of 12 blocks in the historic Deuce had been leveled to make way for large public works. The city’s urban renewal strategy came at a terrible time for many of downtown’s most vulnerable inhabitants. President Regan’s push for deinstitutionalization, a national initiative that closed down mental health hospitals, led to an increase of mentally-ill people living on the streets. The razing of the Deuce destroyed one of the last neighborhoods of refuge, and as a result, the homeless population surged. The newly displaced moved into the heart of the newly “revitalized” city, now lit with trashcan fires in Patriot’s Square. South of the train tracks just beyond the boundaries of the Deuce proper, our building survived the demolition. A surrounding pocket of warehouses escaped the wrecking ball until the development boom of the early 2000s, when investors snatched up property for new hotels, condos, boutique restaurants, and retail. The crash halted the path of redevelopment in our new neighborhood, with renovations stalled in design or stopped prior to construction. The warehouse properties around 3rd Street and Lincoln sit silent, waiting for another chance. We look forward to being part of a revitalized, walkable neighborhood. Until then, we’ll be working away at 521, waiting for more guests to show up. After all, we’re getting this party started!